Volvo has partnered up with a specialist in automobile safety to help improve its self-driving car tech and ultimately sell it to other automakers. The company announced its team up with Autoliv, one of world's leading suppliers in passive and active car safety systems, during a press conference in Stockholm, Sweden earlier today. The primary goal of the collaboration is advancing Volvo's autonomous driving and driver assistance programs - not only to improve the company's own cars, but to also lease the tech out to other automakers to assist in the production of self-driving cars. The new organization formed by Volvo and Autoliv doesn't have a name yet, but it begins operation in early 2017 out of Gothenburg, Sweden. The group hopes to sell new driver assistance programs by 2019, with full-on autonomous driving systems available two years later. "There are no two companies that can claim to have done more for automotive safety worldwide than Autoliv and Volvo," said Jan Carlson, president of Autoliv. "This new company is a recognition of the fact that autonomous driving is the next step to transform road safety." Volvo is taking the autonomous revolution very seriously. 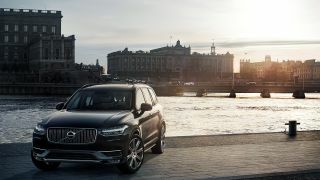 In addition to forming its new company with Autoliv, it set some impressive safety standards lately, stating it intends for no one to be killed or seriously injured in a new Volvo by the year 2020.